This past weekend I had the pleasure of going to a great scrapbook retreat put on by the Heart Of Texas Scrapbook Club (http://www.heartoftexasscrapbookclub.com/). I had a fabulous time seeing old friends and meeting new ones. On top of that I got a chance to participate in a sketch challenge, silent auction for a worthy cause (http://www.openmyworld.org/) and many other fun things. I love being a part of this group because of their giving spirit to so many organizations. I invite you to check out the website and see for yourself! I mentioned the sketch challenge in particular because it was a hard one for me. My friend Jennifer designed the sketch. It required three different pattern papers and three embellishments on a page. I know for many of you this isn't a challenge but I'm a VERY basic scrapper. I rarely use pattern paper and use few embellishments but because I have been trying to broaden my horizons, I accepted the challenge. See below for Jennifer's sketch and my page. I invite you to do your own page based on her sketch and then link to it in your comments. Have fun and can't see what you do with Jen's sketch! I really like how your page turned out. 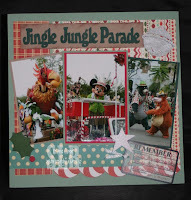 I will try to do a page with that layout when I get back to scrapbooking/stamping after moving rooms around. Great job! 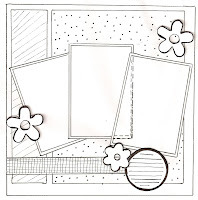 This is a fabulous sketch and you made a terrific layout with it!